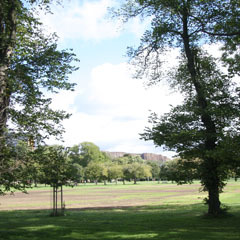 This large public park used to be a lake known as the South Loch until the early eighteenth century. The loch provided much of the city’s drinking water until 1621, when the first piped water supply was established. Its draining and conversion into a park by Sir Thomas Hope in 1722 is a good example of the Enlightenment enthusiasm for ‘improvement’. Later in the century it became a favourite place for James Hutton, the geologist, Adam Smith, the economist, and Joseph Black, the chemist, to take a stroll and discuss the latest ideas in science and philosophy.